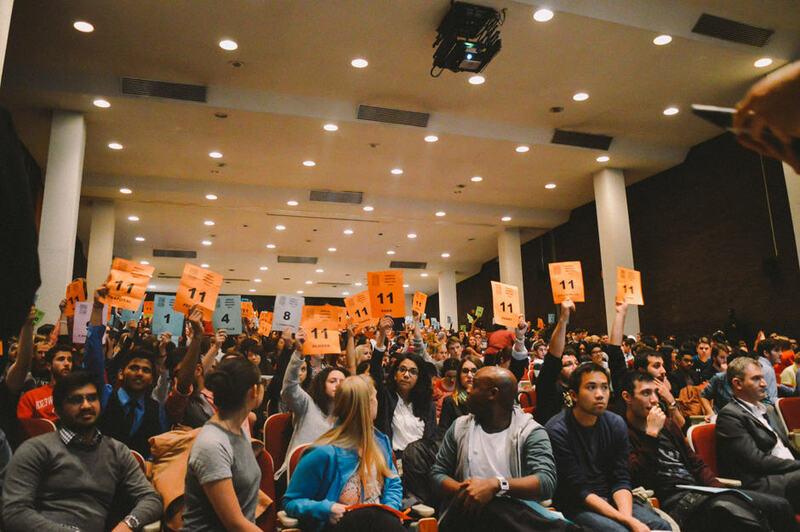 After a heated debate, the controversial proposed changes to the University of Toronto Students’ Union (UTSU) Board of Directors structure were narrowly defeated at the Annual General Meeting (AGM) after having been externalized. Several other bylaw amendments were passed in omnibus. If passed, the amendments would have granted representation to colleges and professional faculties through a committee and replaced the current board structure with constituency directors with purview over specific equity-based issues. Following the failure of the amendment, many students present at the meeting erupted into loud cheers, while others appeared disappointed. Many members of the Engineering Society (EngSoc) voted against the proposal and encouraged fellow students to come and do the same. “I’m feeling relieved, but also saddened, in the sense that knowing this is going to carry on for another year,” said Teresa Nguyen, president of the Engineering Society. “I am pleased with the vote. There was a clear divide in the room and it is important that everyone can agree on a new structure,” said Pierre Harfouche, UTSU vice-president, university affairs. “Obviously, I’m thrilled with the result of the Board of Directors vote,” said Ryan Lamers, president of the Innis College Student Society. However, Lamers said that the vote highlighted the gaping divide between campuses at the University of Toronto. Lamers believes that the vote stressed the need for a St. George campus–focused students’ union. Yolen Bollo-Kamara, UTSU president, said that she was disappointed with the result of the vote given that the majority of students voted in favour of it. The amendments would have passed had they required a simple majority. 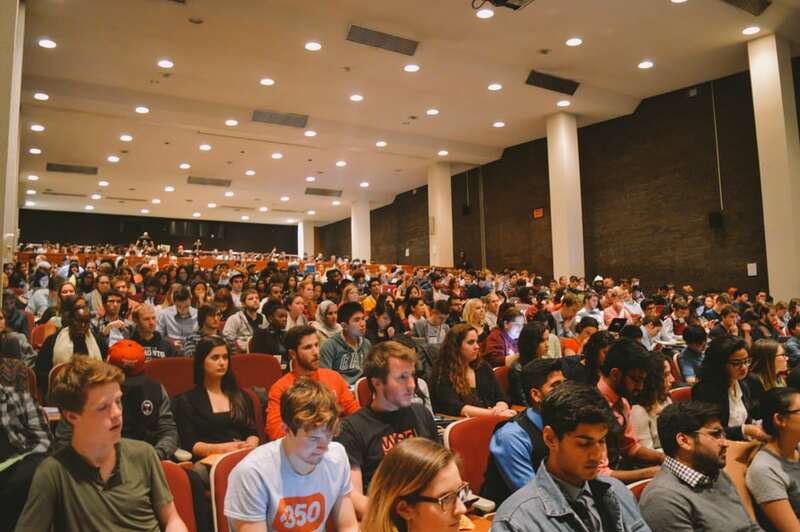 Ashkon Hashemi, the chair of the meeting, called for order and decorum repeatedly throughout the meeting as the students present applauded, chanted, and became increasingly unruly. Several complaints were heard over the course of the evening, including displeasure with some of the language used. “I don’t believe that the space at the AGM was safe. People were constantly being asked to stop heckling, stop hooting, stop shouting/laughing at others. It continued from the very beginning right until the end,” said Ali Sardar. Ali Sardar also condemned the exchanges she saw online. “A large portion [of students] used Twitter to attack and make fun of their peers. I am disgusted by the things I’ve read online,” Ali Sardar said, adding, “If I were a first-year student and this was my first experience, I can guarantee I would never go back.” Ali Sardar said that there is no excuse for the behaviour that took place at the AGM and that she expected better from U of T students. Angelo Mateo, a student in attendance, noted that he saw members of the UTM Blind Duck Pub security team at the meeting. Mateo said it was inappropriate for security to be standing inside the room during the meeting and alleged that their presence was an intimidation tactic. “If the UTSU was actually concerned, they should have asked Campus Police to attend — not the security detail of UTM’s Blind Duck pub,” Mateo said. “The Blind Duck Pub staff have assisted with entry for the past few years, after an AGM where inebriated students created some difficulties,” said Bollo-Kamara, who said that their assistance facilitated smooth entry and minimized delays to the meeting. Following the end of the voting on the proposed board structure, Vip Vigneswaran, former campaign manager of the Unite slate, motioned to adjourn the meeting before a motion mobilizing an anti-war coalition and a motion regarding the Student Commons Management Committee, among others, could be addressed. “I felt that tensions were high, people were tired, and all the contentious issues that required membership approval had been dealt with,” said Vigneswaran of his motion. However, Victoria College UTSU director Zach Morgenstern, who moved many of the final motions, was dismayed at the lack of recognition paid to the projects. “As someone who thinks that the union needs to radically improve its involvement levels, I’m disappointed that I didn’t get the AGM audience,” Morgenstern said. Understanding that many of the students who voted to adjourn the meeting had long distances to commute, Harfouche regretted the lack of discussion on the Student Commons motion. “Not being able to discuss that motion may stall the Student Commons project. It’s unfortunate that leaders from UTMSU [University of Toronto Mississauga Students’ Union] could not communicate this to their members — who were welcome to leave, but did not have to force the meeting to end,” said Harfouche. For her part, Bollo-Kamara was saddened that much of the evening’s conversation revolved around the board structure proposal and that the meeting adjourned early. “We didn’t get to talk about any of the other motions that students put forward,” she said. Ryan Gomes, UTSU engineering director, said that his plan moving forward is to work with the board to craft a new motion that has representation for equity issues and for colleges, as well as pushing forward his original alternative proposal to the membership if the former fails. Patrick Andison, UTSU Trinity College director, expressed the need for an open and collaborative discussion, including open access to UTSU’s legal counsel for all interested parties — regardless of their political affiliation. “This means consultations and meetings with college and faculty representatives before any further proposals are drafted or submitted,” Andison said. Bollo-Kamara hinted at more consultations and discussion to come. “I am glad that we’ve been able to start this conversation about how best the UTSU can represent its members and I’m looking forward to continuing that over the next 12 months,” she added. Harfouche said that he will be working with the UTSU Executive Committee and members of the Board of Directors to draft a new proposal. Harfouche also said that he hopes to host another AGM in the spring. 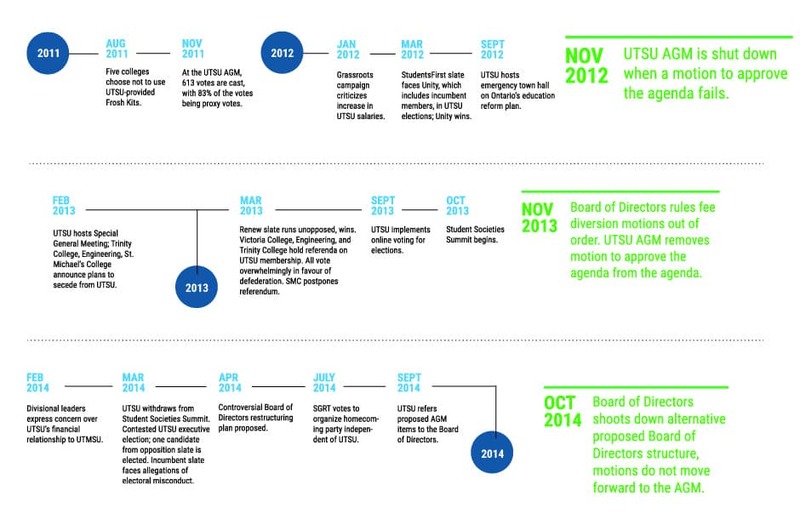 The UTSU has one year to put forward and submit a new structure for the Board of Directors. Note: This is an updated and expanded version of our article published hours after the AGM.